Register for Rock 'N Race today. When you attend our annual Payson Center for Cancer Care's Rock 'N Race benefit, sponsored by Merrimack County Savings Bank, you are making a difference in the lives of cancer patients and their families, while enjoying an evening of activity, food and live music. 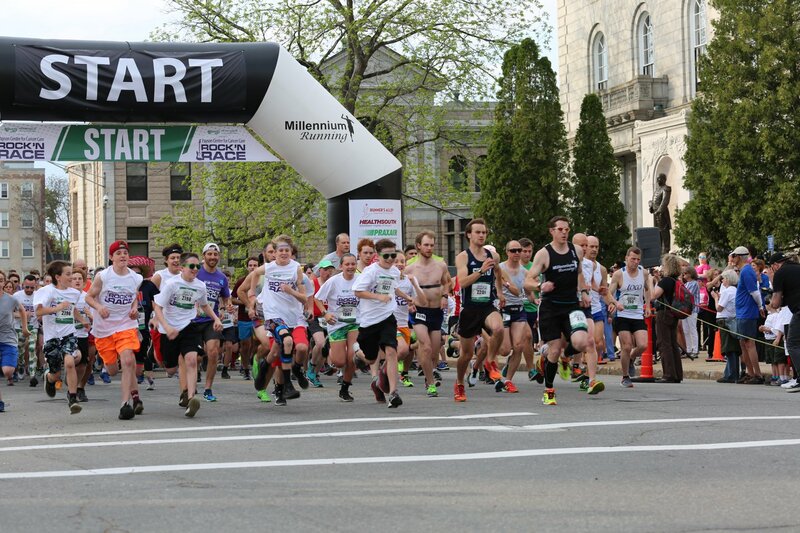 Join more than 6,000 participants in the largest 5K race/walk north of Boston. This special fundraising event is held at the State House Plaza in downtown, Concord, NH. The event is May 16, 2019. Registration fees and charitable gifts to the Rock 'N Race support Concord Hospital Payson Center for Cancer Care. Inside the Payson Center, The HOPE Resource Center provides support programs, social work, nutritional counseling, complementary therapies and funds for out-of-pocket expenses at no cost to patients. Concord Hospital invests nearly $700,000 each year to have these vital services available. By giving to the Rock ‘N Race, you're helping make these services possible. This event has raised more than $3.5 million dollars for Cancer Care since 2003. • Find us on Facebook ~ Like and follow Concord Hospital’s Facebook page to receive the latest information about this event. When you become an event sponsor, your company’s brand is exposed to 5,000+ cause-orientated community members attending the event. Call (603) 227-7162 to invest in Payson Center for Cancer Care’s Rock 'N Race sponsorship opportunities. Payson Center for Cancer Care patient, Melissa Paquette gives a heartfelt thank you to Rock 'N Race supporters.